We have been twice and stay both by the Colosseum and up by Vatican City. The sights are spread across the whole of Rome so there really isn’t a bad place to stay! It’s the city you can keep going back to and all you want to do is see the same sights over and over again. We have to confess St. Peter’s Basilica in Vatican City is one of our happy places and we would go yearly to see it if our banks allowed it. Four days is the perfect amount of time to really soak in this city, although the first time we were there we were there for a full week. Both airports are relatively close to the city and all cabs have a fixed price – don’t allow them to tell you otherwise! You’ll walk everywhere so make sure you wear comfortable shoes. If you’re about to see Vatican City for the first time we can’t even put into words how in aw you are going to be. First, you’ll start by seeing St. Peters Basilica. Now, we’ve seen our fair share of religious buildings, but nothing and we mean nothing compares to this. From the outside it’s nice, yep, but on the inside it will blow you away. The deep purples and royal golds stretching up to the dome with ornate alters and powerful statues littering the walls surrounding will be something you never forget. You can spend hours, and we literally mean hours inside just wandering at a snails pace taking every in and you still won’t catch every little bit of detail. If you ever manage to drag yourself away from St. Peters – and this was a genuine concern of ours – then next up is the Vatican Gardens and Museum. We would highly recommend hiring a guide to take you through, there is so much behind the smallest country in the world it really enhances the experience. You will walk along what seem like the longest hallways in the world with your eyes never leaving the ceiling, see some exquisite art and then to end the whole thing, Michelangelo’s Sistine Chapel. Again, with a neck-breaking-ly beautiful ceiling. Vatican City is a magical place and our number one love in Rome. The first time we were in Rome we arrived, check-in and left the hotel straight away with a b-line straight for the Trevi Fountain. Our hearts literally shattered when we walked around the corner and saw the whole thing covered for renovation works. Tears might have been shed. This also actually sparked our Rome 2.0 adventure. Luckily when we returned two years later it was uncovered and we could appreciate it in all its glory. It’s a bold fountain and unforgivably beautiful. However, due to this, it gets extremely busy so make this your first pit stop in the morning to miss the crowds. Set in a typically Italian Square again the Pantheon is a bold building. The Pantheon has no fills like St. Peters Basilica, it is the sheer size which is captivating. We had a number of lunches on both trips in this square, not because it is the best food – although you can’t go too far wrong, but because of the view and the squares energy. So, everyone knows you can’t go to Rome and not see the Colosseum. It’s everything you want it to be. Huge, imposing and full of history. Again, this is a prime time to hire a guide to take you through. The information which they can give you about the trap doors in the floors, the nature of the games and the reasons for half of the structure disintegrating are fascinating and enhance the experience ten folds. With the tour it’s more than likely the Roman Forum will be thrown in. Unfortunately, due to historical scallywags, there isn’t much left of the Forum. However, it’s still a beautiful, historical sight to wander round and definitely something which shouldn’t be missed for an extra gelato. This is another episode in the Trevi Fountain Saga, but on the opposite foot. We were lucky enough to spend a couple of evenings drinking wine on these steps on our first trip and it was something which made our heart skip a beat thinking about when planning Rome 2.0. However, unfortunately on our return they were gone. All boarded up for more renovation works. Now, we totally appreciate that such historical sighs need upkeep to keep them looking as beautiful as they do, however, come on guys we need our twilight wine time! Leading on from the Spanish Steps is our second favourite place in Rome and for completely opposite reasons to St. Peter Basilica. Villa Borghese is a set of huge beautiful gardens on top of a hill to the North East of the City. 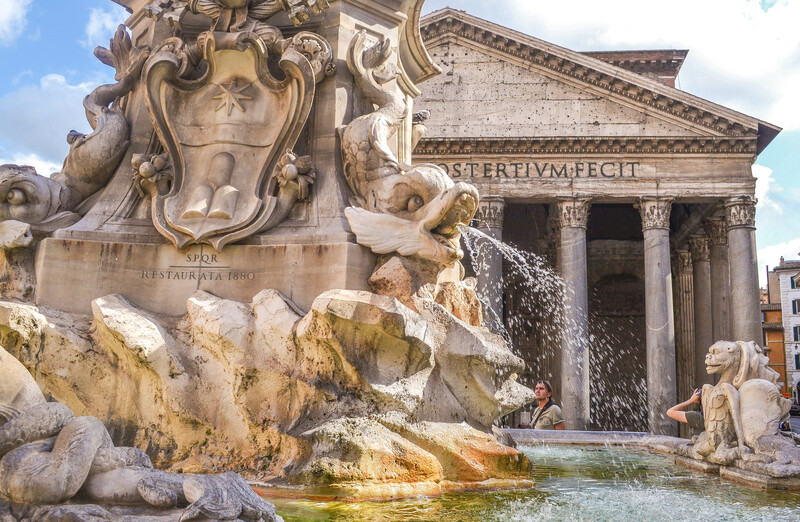 They’re a tranquil break from the bustling streets of Rome. One morning we left our hotel with a picnic from a local market and books in hand and walked to Villa Borghese. We spend the whole day basking in the sun in our favourite spot by an old track and didn’t leave until the sun was going down. Top Tip: You can hire a two or four seater bike to explore Villa Borghese and it’s pretty big so we would suggest picking one up if you want to see the whole thing. So, yes you go to Rome for the architecture and the art but you would be completely lying to yourself if you didn’t admit you were also going for the pasta, the pizza, the mozzarella, the gelato and of course, the wine. We’re of the opinion that it is quite hard to have a bad meal in Rome and even harder the have a bad bottle of wine but our number one destination for dinner was always Trastevere. Trastevere is in the South West of the city and a little off the beaten track. This is where a lot of the student accommodation is and from what we understand, where the locals come to eat. The vibe is electric and a great place to spend the evening. Rome is a fantastic place and if it’s not on the list, please put it on the list, you will not regret it.